Do you believe your home or business is haunted? Seeing or hearing things you can’t explain? Contact us at Haunted Auckland. We’re here to help! Please use our simple contact form below to get in touch. If you’ve seen or heard something you believe to be paranormal, or you’ve simply got a story to tell, we’d be glad to hear from you! Also, please read through our list of commonly asked questions below. They may provide you with answers or clarification before contacting us, or suggest important information you should include when submitting the contact form. Q: Can I join you on an investigation? A: On the majority of our investigations we unfortunately cannot allow guests or spectators. Our research requires us to attempt to limit all possible sources of audio contamination to ensure we get clear recordings, so we have protocols and equipment which require some training in order for us to get the best out of our visits to locations. Similarly our clients must have a high degree of trust when we investigate a location, so our current team are vetted closely to ensure professionalism is maintained. However, we do host events throughout the year where the public can attend investigations. Updates and information on upcoming events can be found on our Public Events page. Q: Can I join the team and become a paranormal investigator? A: We’re always on the look out for keen new investigators. Bear in mind we are a volunteer organisation, we do not charge for, or make profit from our investigations, so team members are expected to bear the costs associated with attending investigations. We do not have membership fees, but occasionally there may be group costs to which team members need to contribute (travel, location/equipment hire etc). Each investigator is responsible for purchasing and maintaining their own equipment. At minimum we require our investigators to own a camera (DSLR preferred) and digital audio recorder. We also expect investigators to be able to operate their equipment proficiently, which includes downloading and archiving photographs and audio from their devices and sharing with the team for analysis. Investigators are responsible for analysing any data, images or audio they capture during the investigation and presenting any evidence to the team, as well as sharing any field notes or experiences for inclusion in our investigation reports. If you believe you have skills to contribute to the team, please feel free to contact us explaining why you think you would be a good fit. Q: My house is haunted and I need a ghost buster, can you come and exorcise/bless/cleanse my property? If you are experiencing paranormal activity in your home or business and need help, please use our Assistance Request Form. 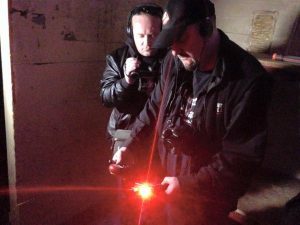 A: Our primary focus is paranormal research, as such our goal is to try to capture evidence of the paranormal. While we have team members who can perform cleansing rituals on locations, we first need to ascertain whether there is any paranormal activity occurring. We do not charge for our services, so our “pay-off” is the opportunity to collect audio-visual or other such evidence of unusual or unexplained activity. During the course of our research, we may be able to find rational explanations for the activity you are experiencing in your home, or provide you with support and methods which will help you to feel more comfortable in your home or place of business. We cannot however guarantee that we will be able to remove or banish any perceived sources of paranormal activity from a location. If you would like us to investigate your home or business, please contact us using the form below and supply as much detail as you can about the activity you are experiencing. A case manager will then be in touch to provide a preliminary questionnaire to assist us with gathering further information on your case. Any information you provide will be kept private, however we will seek your permission to document any findings on our website or via other online media. Specific names and details of your location will either removed from the report or changed to maintain your privacy. In addition we may need to consult with trusted external experts regarding details on some cases. Our Client Testimonials page contains feedback from our previous clients for you to review. Q: I have taken a photo/video/recording of a ghost, can you have a look at it? A: We are more than happy to analyse any photographs or recordings for evidence of the paranormal. If submitting a photograph, we prefer the original image taken straight from the camera or phone as original files contain additional “metadata” which greatly assists us in our analysis. Photographs which have been uploaded and re-downloaded from Facebook have this metadata stripped from the file, and are often compressed or altered by the uploading process Facebook uses. If you have a large image file or a series of images, we recommend you upload them to a photo sharing site such as Flickr or Google Photos, or file storage sites such as Dropbox and provide us with a link to retrieve them from there. Please do not resize, crop or enhance your photographs in any way. Please do not amplify or attempt to enhance any audio recordings. Photographs taken using smartphone “ghost detector” apps, or apps which modify the image after it is taken will not be considered for analysis. If you are experiencing paranormal activity in your home or business and need help, please use our Assistance Request Form instead. I have read through the commonly asked questions above.